Now that I am back into the swing of things I decided to start with something interested...so I looked around my place in hope of getting some inspiration. I did that for two days and nothing. So on that following Sunday I decided to clean up my place you know like a spring cleaning type of cleaning in preparation for summer, and I found all these kraft paper bags that you collect from the many shopping trips we all love. Like always I chunk them in the paper recycled bin and did not think of it again. But that same night I was reading an online article and they had some pictures, of recycled gift tags using magazine pages and all of a sudden I thought how about I do the same with those bags I just threw out. So I grabbed them out of the bin and cut them up and removed all the handles. Then I went through some of my cliparts and stuff I have done before and found a couple of images that I felt would be well showcased on the kraft paper. I was still not sure then what I wanted the end product to be. 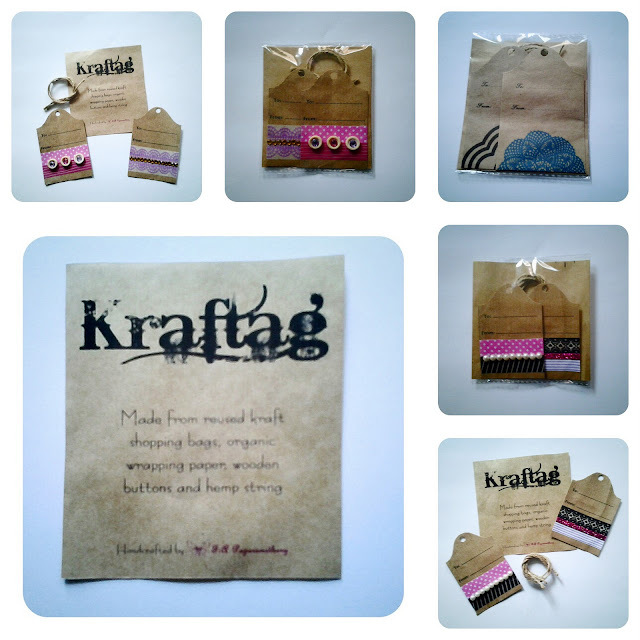 I mulled over the concept for a day or two and then I just got one day and decided that I was going to make gift tags and called them Kraftag. It was funny because I was getting ready to go to work (you know the 8 to 5 kinda job), and I had this need to at least create one set of tags. I went straight to this program I use - Serif CraftArtist, and selected a couple of embellishments and then created a template for a gift tag with a difference, curved top instead of the typical hexagon top. And voila end product number one the blue one on the right, and then it snowballed from there, I did a couple other printed version. But then I moved on to washi tape and made a couple of those. I used buttons and jeweled buttons on these one for decoration. I hope that is a good sign of things to come now that I am focussing on my creativity once again. Hope to be making more of the same and continue in this dream of mine.